Brian Head Ski Resort, located in Brian Head, Utah, has the highest base elevation in all of Utah and the driest snow conditions in America. These two factors combine for consistently excellent ski conditions sure to give you a quality ski vacation experience. Not only does Brian Head Resort offer excellent ski conditions and amenities, it's also easily accessible. Residents of St. George, Utah can reach the resort in just over an hour, while Las Vegas residents can make the trip in three hours. Because Utah's I-15 and state highway 143 are so well maintained, travel is easy and virtually free of hazards regardless of weather conditions. Brian Head Resort offers some of the least expensive lift tickets in America for high-quality skiing. Adults can expect to spend roughly $50.00 or less for a single lift ticket, while children and seniors cost between $25.00 and $40.00, depending on the ticket amenities. The more days you plan on spending on the mountain, the more money you can save, as the resort offers discounts for multiple-day passes. When planning your trip, make sure you check out the resort's website for their latest deals. Brian Head Resort offers a full-service ski school that includes instruction for children, teens and adults. Enroll yourself or your children in a class based on age and ability level. Their kids camps include lift tickets, lessons, equipment rental and lunch, all for a steal at around $100.00 or less, depending on whether you're enrolled during a holiday period or not. Similarly, adult and teen lessons for snowboarding and skiing include equipment rental, a lesson and a full-day lift ticket, definitely making the instruction worth it if you've never skied before. Reservations are required for all ski camps and lessons, so make sure you plan ahead if you want to enroll. Lodging for your ski vacation is extremely flexible, making it easy to make your choice based on preferred amenities or budget. Options for lodging include motels/hotels, cabins, condos, rental houses and bed and breakfasts. You can practically choose your price point, opting for the low-end hotel at roughly $50.00 per night, all the way to a five-bedroom cabin that sleeps 20 for more than $600.00 per night. Check out the Brian Head Reservations website to get more information on specific lodging options. Food options are similarly varied. Unlike some resorts that offer high end dining along with casual cafeteria food, Brian Head keeps things simple with a breakfast and lunch menu of typical fare: breakfast baked goods, sandwiches, burgers, soups, salads and coffee. 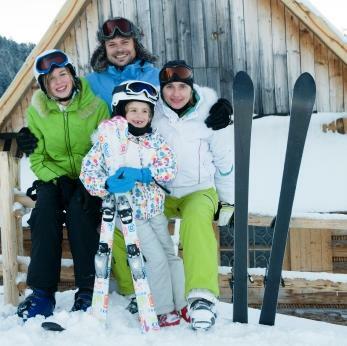 Brian Head Ski Resort is one of the best options for family-friendly skiing. If you're a budget-conscious parent who wants to share the joy of skiing with your children, the flexibility of lodging, dining and multiple-day discounts make Brian Head a perfect option. Check out their website for the latest deals and plan your trip during non-peak time periods, avoiding major holidays like Christmas, New Year's and Martin Luther King Jr. Day. Check out their event calendar as well to see whether they're hosting a special program or event that you and your family would enjoy. All of these factors can play a part in creating family memories without breaking the budget.